Architectural Depot is your source for exterior shutters crafted in a variety of high quality materials designed to meet your needs. Whether you seek popular vinyl, durably fiberglass, or authentic wood shutters, we have an ideal shutter for your exterior. Our shutter selection includes classic shutter styles, such as the standard louvered shutter, relaxed board-n-batten shutters, combination shutter styles, as well as attractive bahama shutters. We offer standard sizes as well as custom sizes for an ideal appearance. 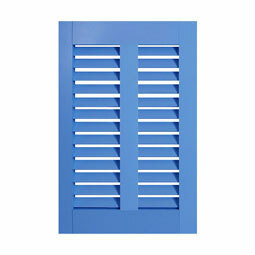 From the style of shutter to the size of shutter your sure to find the right louver exterior shutter. We offer our louver shutters in vinyl, and for functional shutters we offer our Wood Shutters, Composite Shutters, and Premium Architectural Shutters. Louvered Window Shutters offer tasteful signature styling and a timeless accent to homes. 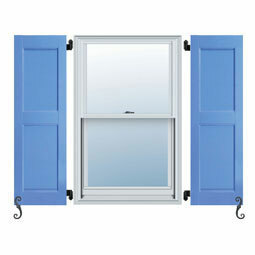 Imagine the graceful yet enduring beauty that these exterior shutters can bring to your home. Choose from one of our many louver combinations. Custom made in a variety of sizes and lengths. Raised Panel Shutters add that traditional colonial look. With a traditional 2 panel to custom 3 panel shutters, our extensive selection will surely fit your needs. From the style of shutter to the size of shutter your sure to find the right paneled exterior shutter. We offer our paneled shutters in vinyl, and for functional shutters we offer our Authentic Wood, Wood Composite, and Premium Authentic Shutters. Raised panel shutters are an ideal enhancement to federal manor homes, traditional colonial homes, quaint craft cottages and other architectural style homes. Several different raised panel options. Available in custom widths and heights. The Combination Shutter originated in the New Orleans area with its unique combination of both louver and raised panel. It offer the beauty of both styles, yet offers a second glance appeal to traditional styles. You can mix and match your styles with a variety of louver and raised panel combinations to make your own unique look. If you are looking for an authentic looking, rustic shutter, our board-n-batten rustic wood shutters are perfect for you. Each shutter is hand crated with rough sawn lumber for an authentic look. These rustic wood shutters can be clear coated, painted or stained. 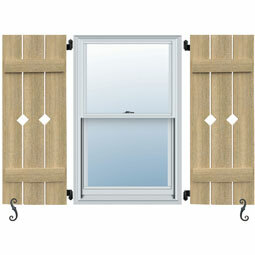 If you are looking for an authentic looking, rustic shutter, our board-n-batten faux wood shutters are perfect for you. Each shutter is modeled after traditional rough sawn lumber which gives a realistic wood grain. These rustic shutters can be painted or faux-stained. Arch windows are a beautiful way to add a great exterior accent to your home, as well as, bringing more light into your home. We offer a complete line of Board-n-Batten arch top shutters that will compliment your arch windows. The perfect combination of both Board-n-Batten and our Flat panel shutters, the Framed Board-n-Batten shutters add a unique look. Commonly used on traditional style homes, the Framed Board-n-Batten shutter has been growing in popularity against the traditional louver, raised panel, and board-n-batten shutter style. Flat panel shutters are inspired after the Shaker design where clean lines and simplicity define style. 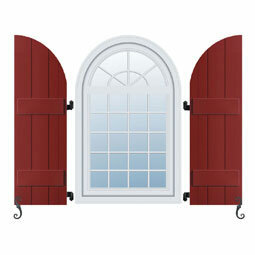 These shutters are perfect for Arts & Crafts or Craftsman style homes. Available in in wood, PVC & Aluminum, and our wood composite, these shutters are hand crafted and assembled for authenticity and architectural correctness. Our featured Bahama shutters, which are also known as Bermuda shutters, are crafted with precision in a variety of high quality materials, whether you seek durable aluminum, the authentic look of our real North American hardwood Bermudas, or affordable and popular fiberglass Bermuda shutters. To meet the needs of our coastal customers, we also offer storm-rated aluminum shutters that conform to Miami/Dade County and State of Florida Codes. The result is a beautiful shutter that provides the safety and endurance that you seek. Our featured Bermuda shutters are delivered to you ready for finishing, or finished in a diverse range of rich and vibrant colors.